Nobody forces us to ingest caffeine. It’s not necessary. We choose to do so. In studies where participants didn’t know they were ingesting caffeine, they opted for caffeinated beverages over non-caffeinated ones. This suggests that something in caffeine makes our brains love it, or at least want it, whether we know it or not. Makes you alert: Caffeine quickens reaction times and improves alertness. It reduces fatigue. Improves mood: People report increased well-being, happiness, and sociability. They feel energized and less depressed. Boosts physical performance: Athletes experience improved speed, endurance, and reaction time. Caffeine helps the body burn fat instead of carbohydrate, blunts pain, and can suppress appetite. 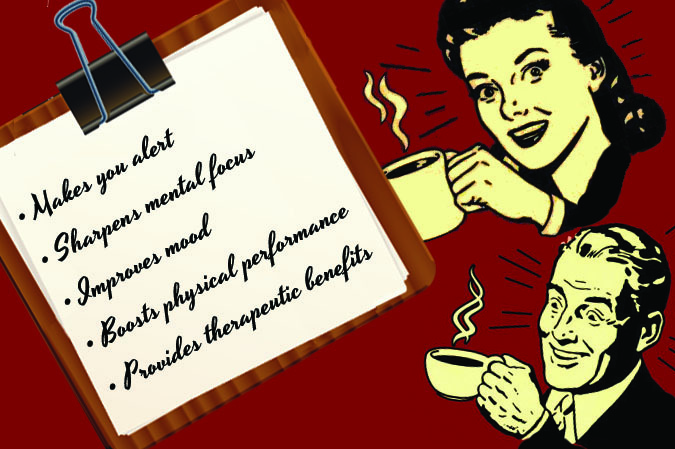 Provides therapeutic benefits: Caffeine relieves pain. It’s also a powerful antioxidant. It can protect certain cells from long-term damage. Current research suggests caffeine may also reduce cognitive decline associated with aging, dementia, and Alzheimer’s. It also appears to prevent gallstones, and is used in treatment for Parkinson’s disease, liver disease, and colorectal cancer. It opens up bronchial passages, and helps asthmatics breathe easier. Caffeine leads to increased stimulation of your heart. At the same time, caffeine can be fickle and flighty in its actions. Caffeine can benefit the heart by dilating coronary arteries and speeding up oxygen delivery. In the brain, caffeine has the opposite effect; it constricts blood vessels, reducing pressure and blood flow to the brain, and relieving headaches. In the lungs, caffeine relaxes bronchial tubes, making breathing easier.